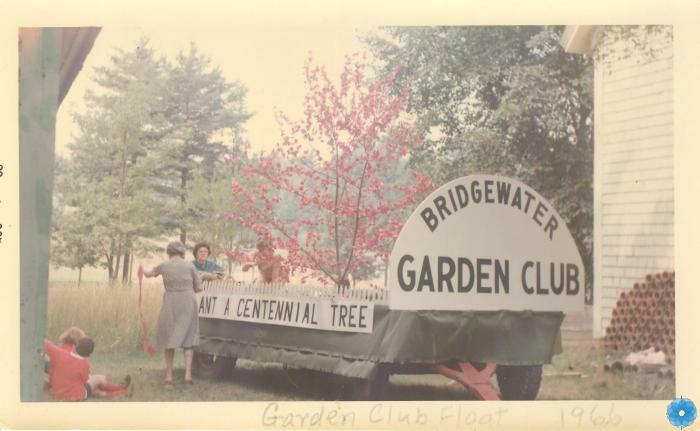 Description: Colour photograph of the Bridgewater Garden Club's float for the South Shore Exhibition parade. There are two unidentified children sitting on the grass and three unidentified women decorating the float. The float is featuring a tree with pink blossoms. The club's name is printed on a large arched shape board at the front of the wagon. A small banner is on the side which reads: Plant a Centennial Tree. A section of large house is at the right side. Lots of trees in the background. Possibly taken on the Gow property, Bridgewater. History of Use: Taken to document float in parade.